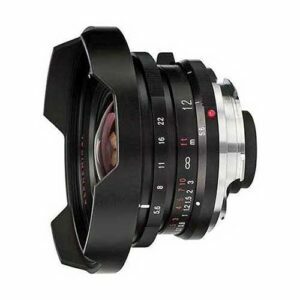 Lens Description: One of the widest 35mm full frame lens in the world. In fact, it is the widest M mount lens to date. The Voigtlander Ultra-Wide Heliar 12mm/f5.6 with 121 degrees picture angle, yield minimal distortion. With it\'s rectilinear lens design, it delivers the higest picture quality with the widest angle unmatched by any rangefinder lenses today. An affordable, high quality lens, popular among the Leica M9 users, which yield an approximate 16mm focal length with 1.33x sensor crop factor with the M8. An indispensible tool for photographers who want to create a wide space perspective.